A question for the blog? I’m trying to find out any information about “Tarleton’s Obelisk”. This was located at the side of St George’s Church – you can see it at far left in the illustration attached. 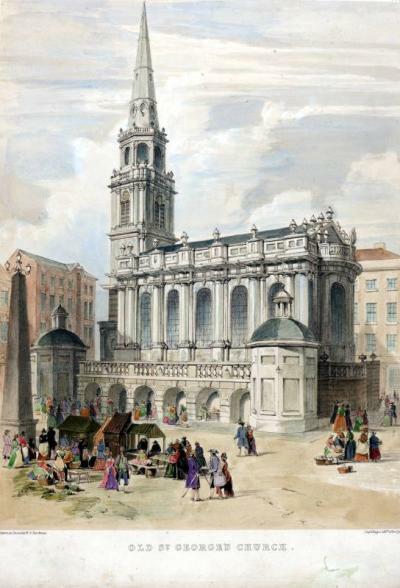 St Georges’s church was built directly over the site of Liverpool Castle between 1726 and 1734. The last service at St George’s Church was held on Boxing Day 1897 and by 1900 it had been demolished and replaced by the Queen Victoria Monument between 1902-6. Perhaps the obelisk was swept away during the same site clearance? I believe it was erected by John Tarleton who was Mayor of Liverpool in 1764/5 and died in 1773. Banastre Tarleton was born in 1754, so he was about 19 when his father died. These dates would therefore suggest that John Tarleton did not commission the obelisk (as I first pondered) as a proud father in recognition of his son’s heroics during the American War of Independence, which didn’t begin until 1775. But I am intrigued as to why he erected an obelisk in that location and what it represented.